Yes, this is actually my sewing studio. 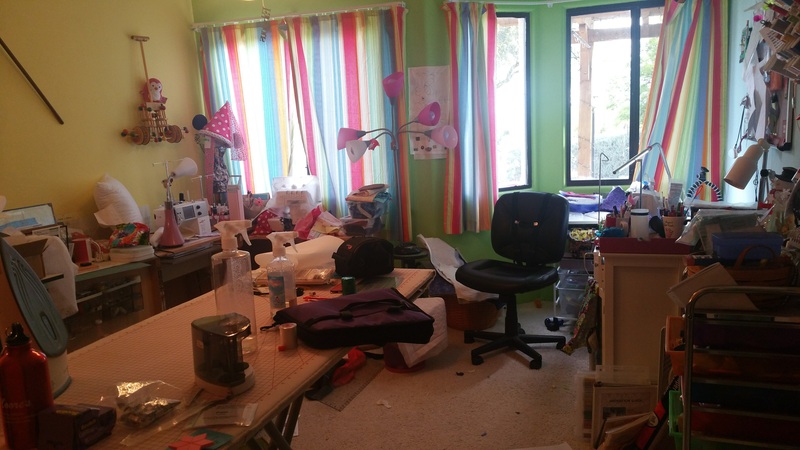 My daughter lovingly refers to this space as “Mom’s Pretentious Sewing Room.” Most days, it looks like this. On rare occasions, it doesn’t. Not exactly ready for the TV crew. This morning I was looking for my Westalee Spacing Gauge. If you’ve ever done ruler work, you know how valuable this little tool can be, I own 3 of them. I could not put my hands on one of them, and then I looked around and saw myself in the middle of an I SPY book. Great activity if you want to distract a child. My first thought was that I should be embarrassed; most quilters would never admit to this mess, let alone take a picture. Then it hit me. I can not be alone. I am willing to bet that there are many other sewing spaces that look just like this. Be honest, what does your space look like? I have several quilting friends coming over next week which is the only reason my area is semi clean right now!